One of the key features added to ASP.NET core with the release of Visual Studio 2013 is the new Identity System. 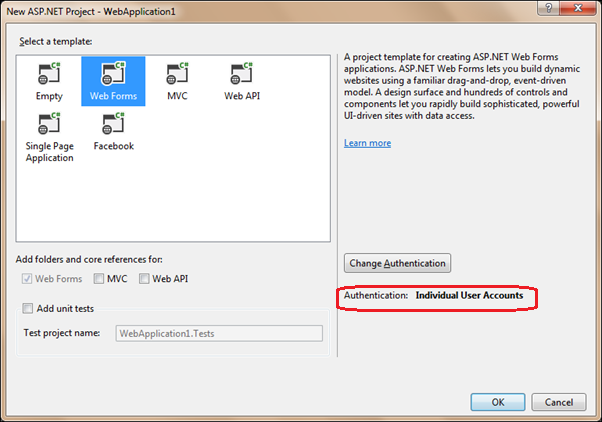 If you create a new ASP.NET project, may it be a Web Forms or an MVC project, you will find the default authentication type selected as "Individual User Accounts". The default templates make use of Entity Framework to persist the user’s information in a SQL Server database. The default database used is an MDF file. ApplicationUser: Inherited from Microsoft.AspNet.Identity.EntityFramework.IdentityUser. The IdentityUser class is inherited from the interface IUser. Any user class in the identity system must inherit from this interface. The class IdentityUser includes all necessary properties needed for a user account, like UserName, PasswordHash, SecurityStamp. This class allows us to add our own properties to a user’s profile. For example, if your web site needs to capture e-mail ID and phone number of the user, you can add them to this page. The IdentityUser class also includes navigation properties for UserRoles, UserClaims and UserLogins. The UserLogin entity is used to store information when a user is logged in using an external authentication provider, like Google, Microsoft, Twitter or Facebook. ApplicationDbContext: It is the Entity Framework code-first DbContext class to create the database with necessary tables. It is extended from IdentityDbContext, the DbContext class defined inMicrosoft.AspNet.Identity.EntityFramework namespace. It includes DbSets for User and Role. This class allows us to add our own DbSets to the database being created. UserStore: A class in Microsoft.AspNet.Identity.EntityFramework namespace. It is responsible for all database operations related to managing users. It needs a DbContext for its work; we generally pass in an instance of the IdentityDbContext. This class implements six interfaces: IUserStore, IUserPasswordStore, IUserLoginStore, IUserClaimStore, IUserRoleStore and IUserSecurityStampStore. Each of them has a specific purpose. IUserStore is for creating, finding, updating and deleting the user information; IUserPasswordStore is for managing password and so on. While writing a custom Identity system, IUserStore is the least interface to be implemented. All methods declared in all of these interfaces are asynchronous and they return Task. UserManager: This class is defined in the Microsoft.AspNet.Identity.Core assembly. It needs an instance of IUserStore type. The UserManager can be viewed as a repository that calls specific methods of UserStore to manage users for the application. As in UserStore, methods of UserManager are also asynchronous. The AuthenticationManager used here is the Authentication object of the current Owin context. The first statement clears any external cookies in the current application context. Then it asks the UserManager to create a claims-based identity for the current user and then the obtained claims-based identity object is set to the current Owin context. The FindAsync method returns null if the user’s credentials are not valid. If credentials are valid, it returns all information about the user. Once the user is found, a claims-based identity object of the user is set to the Owin context. Similarly, the template also generates code for changing password, removing user account and to handle external login accounts. We will see how the identity system manages external logins in a future post.